This is an example of what we state at the top of this blog, “Join us as we search for sequences of ‘seven’ in the Bible, whether enumerated or not,” because the Holy Spirit did not always mention the number seven for us, but we have to look for non-enumerated sequences of seven, as Jim did here. “I set My rainbow in the cloud, and it shall be for the sign of the covenant between Me and the earth. It shall be, when I bring a cloud over the earth, that the rainbow shall be seen in the cloud; and I will remember My covenant which is between Me and you and every living creature of all flesh; the waters shall never again become a flood to destroy all flesh. The rainbow shall be in the cloud, and I will look on it to remember the everlasting covenant between God and every living creature of all flesh that is on the earth” (Genesis 9.13–16). The Bible mentions the rainbow again in Ezekiel 1.28; Revelation 4.3; and Revelation 10.1. 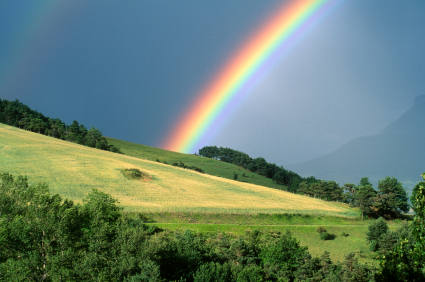 Each of those times Ezekiel and John see a rainbow with God. This entry was posted in Genesis, Rainbow, Seven and tagged Featured, Genesis 9.13–16, Rainbow Around God, seven, seven in the Bible, Sevens, sevens in the Bible, The Seven Colors of the Rainbow. Bookmark the permalink. Many folks don’t realize there is always a secondary rainbow, a much less dramatic but simultaneous iteration of the first. Kinda like us, eh? Thanks, and sorry it took me so long to approve your comment. I got distracted.